JB., originally uploaded by sweetcaroline;. Honeymoon in Mexico, originally uploaded by Texan_heart. *gasp* Somebody worked out for his honeymoon :) I'm just really mad that the paparazzi still go out for them during their honeymoon. GEEZ PEOPLE. I DON'T CARE IF YOU'RE GETTING PAID! LEAVE THEM ALONE FOR ONCE. Aww. They make the cutest couple EVER. "I'll put a flower in your hair." Kevin and Danielle, originally uploaded by Please//Just//Catch//Me.<3. Kenielle on their romantic honeymoon in Mexico. kevin&danielle jonas wedding program., originally uploaded by Natural Disaster..
From an unknown source inside the wedding who attended. 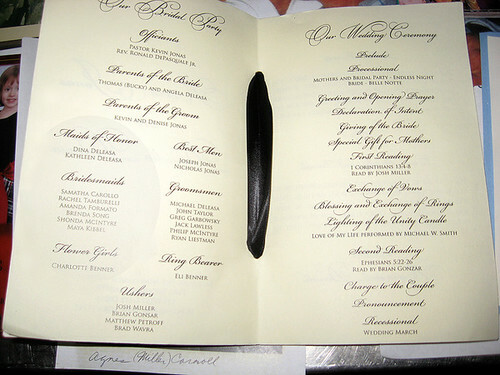 Here is Kevin and Dani's ACTUAL Wedding Program. Heyy I'm back! Sorry guys. Entrance Exams, School Stuff, Erhem . . .JONAS CONCERT! Well, as some of you may have known, Jonas came to CT October 9 and 10. I was lucky enough to get a hold of 2 pairs of Jonas tickets for 10/10, for me and my cousin. (Section 115, Seats 4 and 5). Hmmm. I can STILL clearly remember it. . . .
During the song, "Year 3000," Joe brought up about 5 girls who dressed up as the TELLETUBBIES, who were, which in fact, we met and were right behind in line, and a girl with a gagillion buttons on her. And Joe asks the Telletubbie girls their names, and then he said, "Wait, the Telletubbies had real names? I didn't know that." Ohh Joseph. Then, during "Video Girl", Brad, their LiveNation tour manager, threw a sweater at Joe, and Joe did like a rooster defense sort of move. Thus, led to Brad going on stage to have a 'dance off'. lmfao. Brad, you're dancing was superb. Finally, right before WYLMITE, Joe was saying that John and Jack needed dates to Kevin's wedding, which led to Kevin's love advice. Kevin, BEST LOVE ADVICE ever! Sadly, at about 9ish, the concert ended. The final note went out with a big bang, and the lights came back on. Pshh. We could've stayed there to wait if someone was going to come out, but we hadn't ate since 3 PM that day. And the highlight of my day. We were eating at the Mohegan Buffet, and my cousin and I were talking about what if either the Jonases walked in or one of the band members did. We were all like "Ohh. There seems to be no more seats left, but you can sit on my lap." We stood up to get more food, and then as I was headed towards the dessert table, 4 teenies were following me. I kept walking, but then a little blondie stopped my path, looked at me sternly, and said, "OMG. DEMI LOVATO?!" And then I'm all like. . . . Uhmm. Sure? and continue walking back to my table. Then, when we were at the arcade, we started taking pictures and assumed that they were there, on account that we saw a Red Bull can, thinking it was Nick's. Want to see MY pictures from the concert? Today on this day 8 years ago, a sorrow tragedy happened in our nation. May the souls lost on this day eight yours ago rest in peace, and for the heroes that saved what they could, may God bless them. Keep our thoughts solemn in our hearts. Hey oh! Sorry for not updating again. But here's what I've found. No, I don't have a video of it, but I have a picture. 4.) Nick and Miley in NY together?! Nick Jonas smiled for his fangirls while stepping out of his hotel in New York City on Friday. Ex-girlfriend Miley Cyrus trotted through the city as well. Do YOU think they met up that night?! BPLovesJonas: I got to meet the Jonas Brothers in Birmingham, Alabama on August 16, 2009. It was very nice for them to come over to meet with us. You have to overlook the screaming though (I was so excited). If you look closely you can see Miley Cyrus. She is right beside Nick. NOTE: People are fighting about whether it's Miley or Mandy Van Duyne. And Now the LONG Wait Begins . . . .
ARGH! One more day . . . ONE MORE DAY!!!! I couldn't get tickets from the TJ Presales yesterday . . . :( One more day. Imma gonna wake up @ 9:00 am and sit there clicking away while calling TICKETMASTER. Hopefully I get 'em. :) Wish Me Luck!!!! And from now on . . . I won't be updating my blog as much as I used to, but I'll update it everyday, but only one entry a day. But, I'll have like 5- 15 new things on each entry. So. . . 2.) 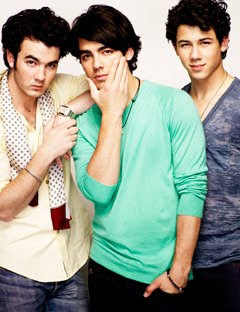 Jonas Bros. Wish Ms. Demi Lovato A Happy Birthday! I AM SOOO SORRY!!! My schedule hasn't been recently as you say, "empty" for the past couple of weeks. School stuff, and all of that nonsense. blah. Well, if you guys are willing to be followed up everyday, you might as well find me on Facebook. 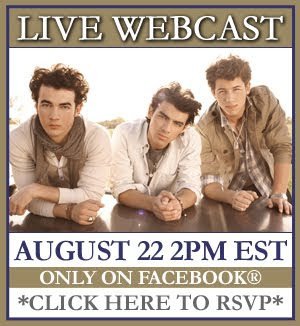 Don’t forget to tune into Jonas Brothers’ Live Webcast this Saturday, August 22 at 2:00pm – 3:00pm (EST)! Click here for more information and click above to RSVP! One of the Jonas Brothers is going to be a guest judge on American Idol! FOX News reports that reality show Pop Tarts has spilled the beans and revealed that one of the three musician JoBros will join forces with the first American Idol Kelly Clarkson at next week’s audition series as celeb judges to find the next singing sensation. Other guest judges on the audition circuit for Season 9 include country sensation Shania Twain, Jennifer Lopez, Victoria Beckham and Mary J. Blige. TELL JJJ: What do you think of Joe judging the singing comp?